I thought I'd posted about this, but apparently not. 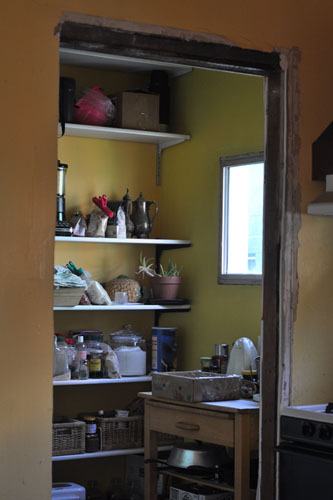 Remember how we fitted out our pantry that the previous owners had turned into a bathroom? Two years ago? We left the doorway undone, because it's really not a renovation project if you actually finish it, is it? 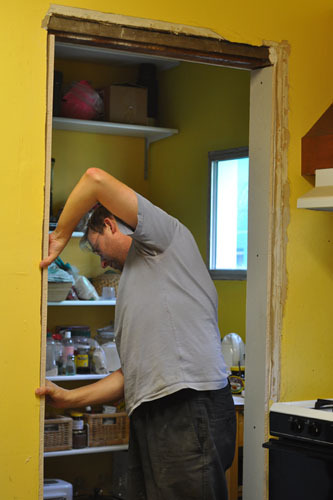 Yeah, for two years, two really awesome years with our fine pantry, we have lived with plaster edges that leave little white stripes on us if we lean against the doorway, and rough wood that gives you splinters if you look at it wrong in easy reach. 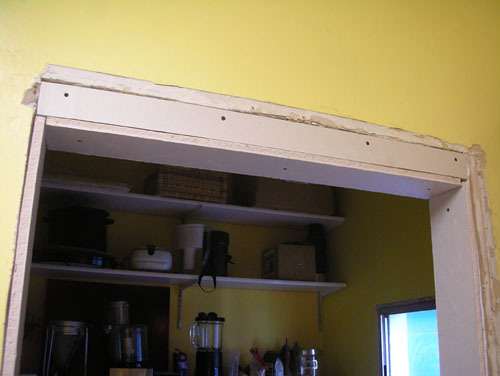 We saved some odd scraps of drywall from one of the other rooms that was getting drywall work done, and then spent months talking about how to address the weird little gap at the top -- the sort of problem it's easy enough to deal with right away, but then you start fussing over it and it seems insurmountable. Anyway, back in May we cut and put the side pieces in place. But it wasn't until I went away last week that Noel got around to doing the last couple pieces. He even used the fancy drywall spray glue (see those streaky read bits?) 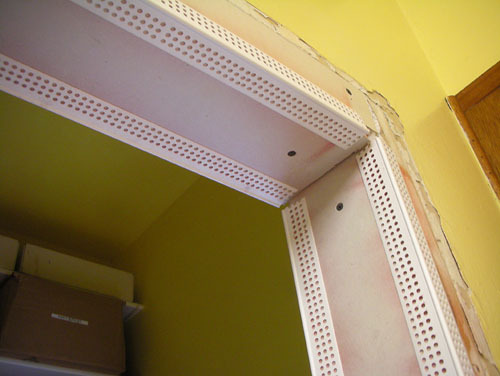 to put the corner bead in place. This means I only need to move the stove and the refrigerator and plaster this all up, then prime and paint and we are good. And you know that's going to happen Right Away.